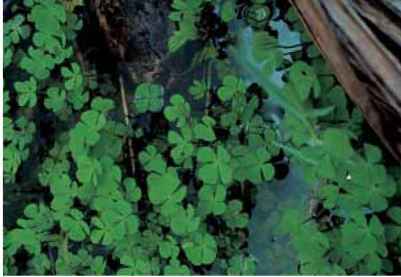 The water clover ferns are most unfernlike in their four-leaf clover configuration as well as in their preference for floating atop still waters. Most of the world's 50 to 60 species are from tropical wetlands, but a few grace ponds and gather at water's edge in temperate zones. The rhizomes spread about in the muck of bottomlands sending up fronds with signature clover-shaped pinnae that decorate surface waters in light shade or preferably sun. Their complex reproductive cycle, arising from underwater sporocarps (hard podlike structures) enclosing microspores and megaspores, differs from the traditional pattern of land ferns. Furthermore, this fertility arrangement keeps most of the definitive distinctions among the species well hidden under the floating frond canopy. The species are attractive aquatic features and can be planted directly into the underwater soil or cultivated in pots and plunged into permanently wet conditions such as pond margins. Propagation is best achieved by cutting apart rhizomes, but the scientifically inclined may want to try spores, which if kept dry in the protection of their sporocarps, remain viable for more than 100 years. 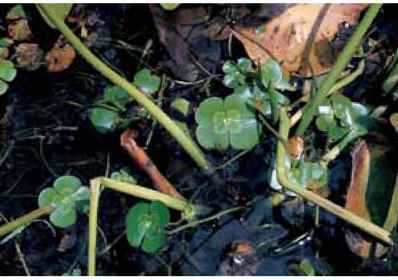 Historically, the practical uses of this species do not have a happy tradition, as the sporocarps of Marsilea drummondii are the "nardoo," that, because of incorrect cooking preparations, took the lives of the British explorers William Wills and Robert Burke while traversing Australia in 1861. Their deaths are now explained as being the result of beriberi, a disease resulting from a vitamin B1 thiamine deficiency. The "nardoo" containing the thiamine-destroying enzyme thiaminase was a principal and filling element in the explorer's diet and slowly killed them. 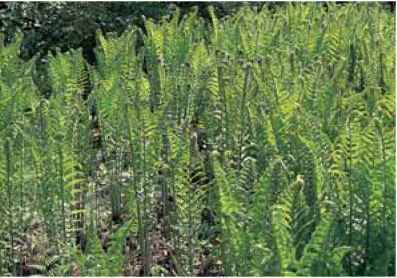 Incidentally, this same enzyme is in bracken, Pteridium aquilinum, but in lower concentrations. Watch your diet. The name Marsilea honors Count Luigi Marsigli (1656— 1730), an Italian botanist. Marsilea drummondii (after Drummond) is a small deciduous species which needs bright light to thrive. The hairy foliage is a drab green. Some forms grow in mud and water while others adapt on land. Distribution is widespread in Australia where the native populations have used the sporocarps for food. Improper preparation leads to death. See notation in the introduction. Marsilea minuta (small) is a petite species growing to 3 in. (7.5 cm). It is widespread in its native Southern Hemisphere habitats, especially India and Africa, and can be cultivated in comparably warm sites. Marsilea mutica (without a point, blunt) has 2- to 3-in. (5-to 7.5-cm) rounded, cloverlike leaves colored in two tones of green separated by a thin brown band and riddled with outstretching veins. This unusual variegated characteristic, vaguely hinting of various types of oxalis, easily identifies the species. It is native to Australia and New Caledonia, and accepts summer, but not winter, life in the cooler waters of Zones 6 to the warmer ones of Zone 10. In areas where freezing is an annual expectation, cultivate it in containers that can be transferred from summer ponds to winter shelter. Marsilea and Azolla share a water feature in the O'Byrne garden. Marsilea at the Dallas Arboretum. Matteuccia spreads freely in the wild in Wisconsin. 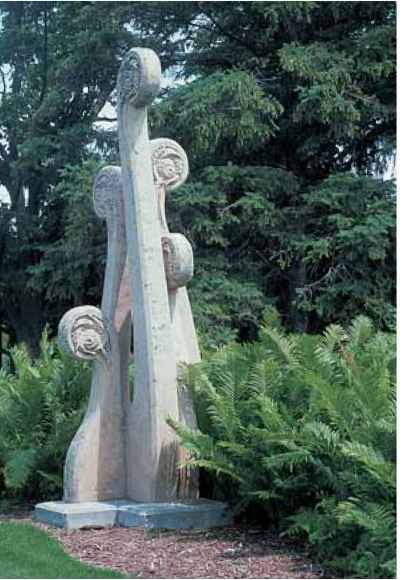 Matteuccia celebrated in statuary at the Olbrich Botanical Garden, Madison, Wisconsin. Marsilea quadrifolia (divided into four) is the most commonly cultivated, recognized, and available Marsilea species in the U.S. trade. It is native to Europe and Asia and has escaped in the American Northeast. 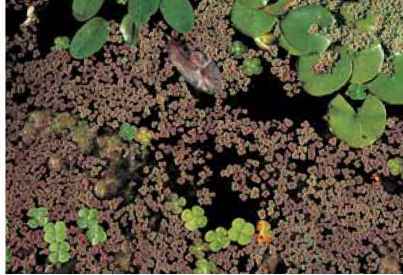 The small, glossy, deciduous "clovers" are up to an inch (2.5 cm) across and prefer to spread in still waters and sunshine. 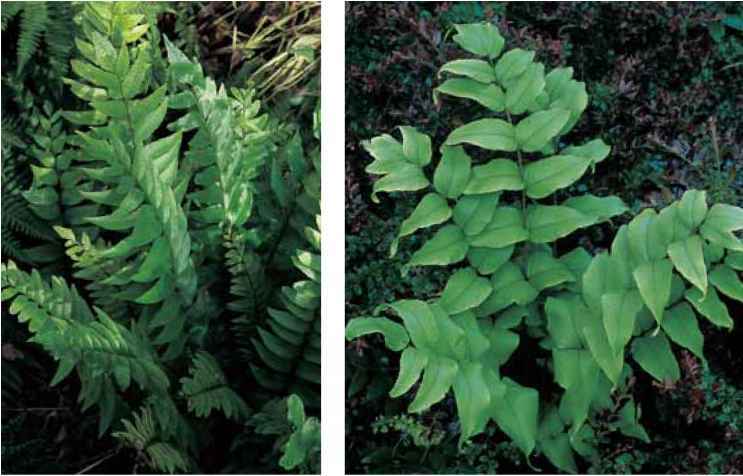 This ferns serves elegantly as a top dressing, providing a finishing touch on aquatic features from those of the home garden to the sumptuous displays of botanical gardens in Zones 6 to 9. Marsilea vestita (covered) is an extremely hardy, deciduous species that populates streamsides, marshes, and riparian sites in the eastern United States. The rhizomes are long-creeping and the pinnae are 1/4 to V2 in. (6 to 13 mm) long and wide. 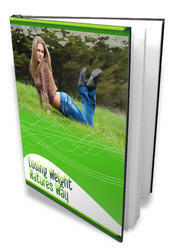 It is easy to cultivate in aquatic sites or consistently wet soil in Zones 3 to 10.